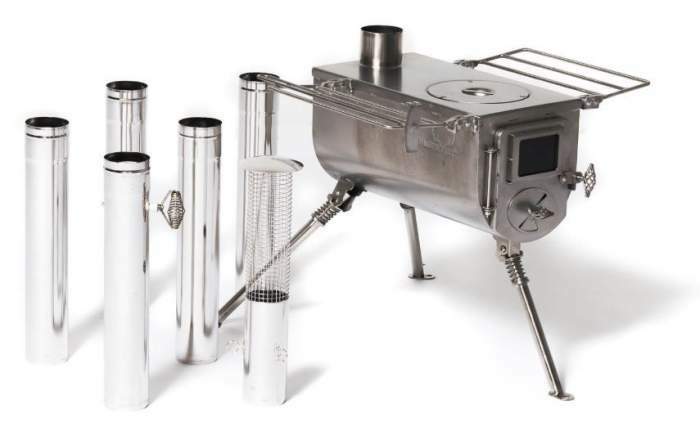 Winnerwell Woodlander Medium Tent Stove is a portable stainless steel wood burning camping stove for cooking and heating, suitable for cold weather camping tents. This is a stainless steel structure. Check on Amazon, they usually have the best prices and shipping conditions with their stores on several continents. This Winnerwell Woodlander Medium Stove is the smaller of the two Woodlander stoves, with a 800 cubic inches (13.1 liters) firebox and a 2.5 inches pipe. It is designed for cooking, heating, and drying your stuff, so you have a sizeable cooktop and two folding side racks. All the elements in the picture are 304 stainless steel, lightweight but durable, built to last without warping and rust. This is the same material used also in their Nomad Medium Stove and the official firebox capacity is the same. What you cannot miss noticing is the attention to detail here. Just see those beautifully designed handles on the door and on the pipe damper and those folding legs. Capacity-wise, the firebox is as mentioned above but they do not provide any information about the tent size which could be heated. My very rough estimate is the same as for their Nomad Stove, somewhere in the range 72 – 134 ft² (7 – 13 m²) assuming this is a proper winter camping tent without mesh on the ceiling. Weight-wise, here again you have something very similar to the Nomad Stove; this Woodlander stove weighs 20 lb (9.1 kg). So it is portable and equally important nicely packable with its packed size of 15 x 8 x 8 inches (38 x 20 x 20 cm). You will see how it compares to other stoves, there is a comparison table below. 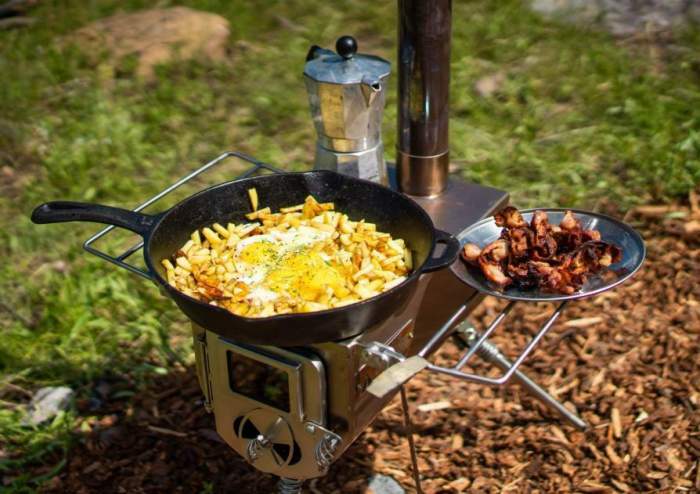 This stove is nicely packable and portable. Regarding the users, this is a stove for winter and cold weather camping tents and it can be used by explorers and adventurers, as a basecamp tool for mountaineers and climbers, it is suitable for hunters, for families. They write it is not intended for coal burning, it is for recreational use and not for residential use. All elements that come with this stove nest nicely inside the firebox for transportation. The stove top is 1/8 inches (3.2 cm) thick steel and the rest of the body is 1/16 inches (1.6 mm). After some use, the stove gets a nice dark patina, this is normal so do not be concerned about it. You have them three, they open wide and also fold when you transport the stove. 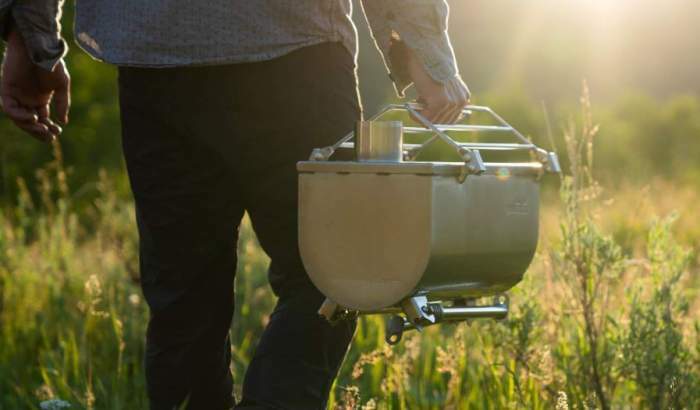 So this makes it different from the Nomad Stove where you have four legs. Note that they are spring-loaded. In the picture above you see how they fold when you move the stove around. The two racks are very wide and folding, so they double as handles when you transport the stove as you see in the picture above. Observe that the stove currently on Amazon has the racks at the same level as the cooktop, so they effectively extend your working surface when cooking. But in the video below you can see a version where the racks are a bit lower. In my view, the former is a better design. The side shelves extend the working space. As mentioned above, there are 5 plus a fire arrestor section. The first pipe is with the damper so it comes ready to use, nothing to do yourself. The set is to use it on the roof. If you need to close the opening on the roof properly, you might want to add a 45-degree section and also to add a double wall pipe, you will see both elements below. To pass the pipes through the side wall, you will have to add one 90-degree pipe section (see below). So they have you covered with all the elements you might need. The door with a glass window and a vent. Weight: 20 lb (9.1 kg). Assemble size: 25 x 20 x 94.5 in (64 x 51 x 240 cm) – the height is from the ground to the spark arrestor. Packed size: 15 x 8 x 8 in (38 x 20 x 20 cm). Firebox size: 800 in³ (13.1 liters, 13110 cm³). Compatible with Medium Size and 2.5 in Winnerwell accessories. The manufacturer recommends operating the stove outside for the first several burns to practice the fire starting technique and to optimize burn temperature. To quickly establish a hot bed of coals to initiate a strong draw of air it is important to use a generous amount of small tinder. To avoid smoke spillage, in particular in the beginning when you start the fire, open the door slowly. Do not use flammable accelerates like a lighter fluid. When the stove burns hot enough there will be little smoke or no smoke at all visible from the chimney pipe, otherwise it is not burning efficiently. The manufacturer recommends at least 18 inches (46 cm) between the stove and any combustible material. If you use a non-combustible heat shield, clearances can be reduced by half. They recommend using a Double Wall Pipe Section where the flue exits the tent; you will see it in the picture below. Make sure the flue exits through a fireproof stove jack. If possible (e.g., in a floorless tent) secure the legs of the stove using tent stakes or anything similar to prevent the stove from tipping over. Do not leave the stove burning unattended. In the presence of children or pets they recommend the use of fence panels or a stove guard. Burn clean and dry seasoned firewood to avoid carbon monoxide. Clean the flue approximately every 20 hours of burn time. In this way you will avoid excessive creosote build up. In this video you can see the stove in a canvas tent and with a 45-degree pipe section. Observe that the racks here are not on the same level as the cooktop. When you choose such items, bear in mind the pipe 2.5 inches. The water tank you put at the back of the cooktop so you still have a free area for cooking. You can melt snow or ice and boil it in several minutes. With the Pipe Oven you also choose the 2.5 inches and attach it instead of the second pipe. You can make biscuits and cookies, and also bake potatoes, meat, etc. So regarding the functionality, the Winnerwell Woodlander Medium Tent Stove is almost the same as their Nomad Stove, and the same holds for the price. They are both expensive yet worth the money. But the difference is in the design, this stove has three legs and an oval bottom, the door vent is also completely different. 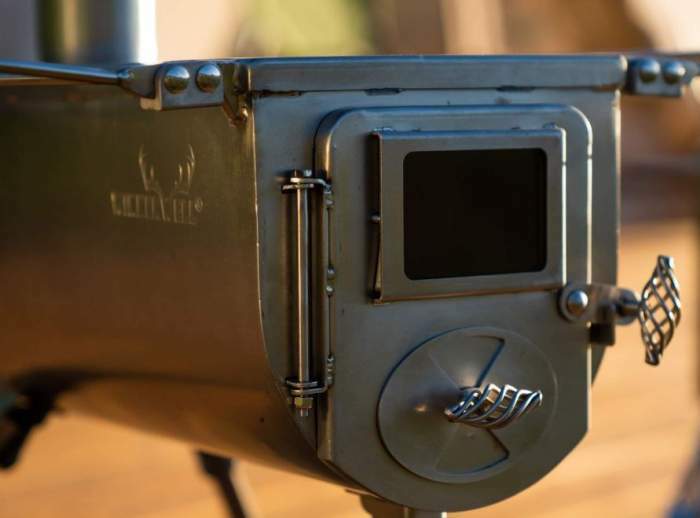 This stove is included in my list of the best tent stoves for wood burning. You might want also to check this Timberline Wood Stove which includes a water tank in the package. But if you need a backpack-portable wood burning tent stove, please check this Winnerwell Fastfold Titanium Tent Stove and also the Uncompahgre Collapsible Pack Stove. If you are on a budget, you have yet another alternative in the comparison table above. As for the appropriate tent for such a stove, please check my list with tents for cold weather camping. Note that this is not a sponsored text and I am not paid by the manufacturer or related to them in any way. I am only expressing my own unbiased views about this product. Do you have any experience with this stove? If so, please share it here, there is a comment box below. Have a nice day.